Can you afford not to trust him?! In just 16 years over 400,000 Facebook users disproved Pascal’s famous 360 year old Wager due to the fact that these Facebook believers took the Pascal’s Wager Challenge and ALL 400,000 proved Pascal’s Wager was wrong! 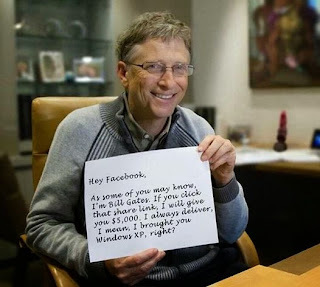 Even though the facts were out for years, people just couldn’t believe that a picture of Bill Gates himself holding a promissory note shared by hundreds of thousands was a huge lie! Hey (according to Pascal’s Wager), go ahead; what have you got to lose except tens of thousands of dollars and can you really afford to be that foolish?! So can you simply afford not to trust what over 400,000 people believed to have been the Gospel Truth? Finally, someone needs to post a picture of Jesus Christ also holding up a sign claiming eternal Heavenly bliss if you not only believe yourself, but "Share" this divine promissory note with all your friends. After all, if you’re a non-believer, what have you got to lose?